On the stump, Sen. John McCain often cites his work tackling the excesses of disgraced lobbyist Jack Abramoff as evidence of his sturdy ethical compass. A little-known document, however, shows that McCain may have taken steps to protect his Republican colleagues from the scope of his investigation. In the 2006 Senate report concerning Abramoff's activities, which McCain spearheaded, the Arizona Republican conspicuously left out information detailing how Alabama Gov. Bob Riley was targeted by Abramoff's influence peddling scheme. Riley, a Republican, won election in November 2002, and was reelected in 2006. 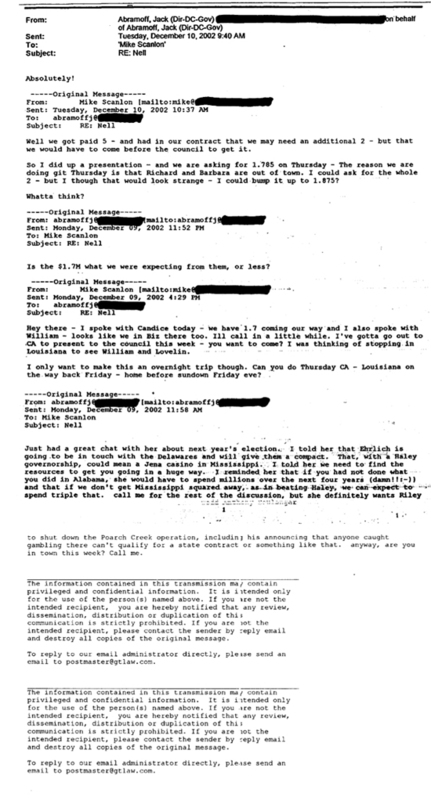 In a December 2002 email obtained by the Huffington Post -- which McCain and his staff had access to prior to the issuance of his report -- Abramoff explains to an aide what he would like to see Riley do in return for the "help" he received from Abramoff's tribal clients. An official with the Mississippi Choctaws "definitely wants Riley to shut down the Poarch Creek operation," Abramoff wrote, "including his announcing that anyone caught gambling there can't qualify for a state contract or something like that." The note showed not only the reach of Abramoff, but raised questions about Riley's victory in what was the closest gubernatorial election in Alabama history. And yet, despite the implications of the information, McCain and the Senate Indian Affairs Committee sat on the controversial portion of the email. According to an official familiar with the investigation, McCain also subsequently refused to make the email public after the report was released. There was a brief footnote in the report that quoted William Worfel, former vice chairman of the Coushatta Tribe of Louisiana, saying that Abramoff told the chief of a Mississippi tribe to spend $13 million "to get the governor of Alabama elected to keep gaming out of Alabama so it wouldn't hurt ... his market in Mississippi." But Riley's name and the details of what was being asked of him were not mentioned once in the 373-page document. Indeed, as the Associated Press noted in 2006, McCain stayed deliberately agnostic as to Riley's involvement. "The committee headed by Sen. John McCain, R-Arizona, used the ellipses and did not give the full quotation," the AP said of Worfel's quote. "It also did not say in its report whether it thought the comment was fact or fiction." Officials with Riley's office pointed to a statement from the Choctaw tribe alleging that reports of their contributions to Riley were "outlandish and patently false." As for the governor's opposition to gambling, Riley's press secretary said he has "consistently [opposed gambling] before he decided to run for governor and since. Anyone who would suggest his long-standing opposition to gambling is tied to anything other than personal conviction would be mistaken." McCain's campaign did not return request for comment. For critics, however, the senator's decision not to include the email in his report underscores not only a glaring shortcoming of his investigation, but also a chink in his political veneer. Indeed, they claim, the Arizona Republican often takes overt steps to protect Republican colleagues from his anti-corruption dragnets. "Although Sen. McCain has long bragged of his role in the Abramoff investigation, he let Tom DeLay and the other members of Congress who were doing Abramoff's bidding completely off the hook. The sole exception was Rep. Bob Ney, who served time in prison," Melanie Sloan, Executive Director of Citizens for Responsibility and Ethics In Washington told the Huffington Post recently. "Sen. McCain knew what his colleagues were up to, he chose to take the easier path and give them a free pass." Faced with this criticism in the past, McCain has claimed that it was not his responsibility to "involve ourselves in the ethics process [of senators]." Others have defended McCain by pointing out that the committee approved the report by a bipartisan 13-0 vote. But it is hard to ignore the political consequences of not exposing the Abramoff-Riley connection. Just prior to the 2002 election, word leaked that federal prosecutors in Alabama -- appointed by President Bush -- were investigating allegations that then Alabama Gov. Don Siegelman had offered a state-appointed position in exchange for money to help an education program. Siegelman ultimately lost to Riley by less than 3,000 votes. "It obviously didn't help," said Dr. Sam Fisher, a political science professor at the University of South Alabama, of the leaks. "And there were certain ethical issues about how that was done. It was definitely a close race and giving a close race any negative thing can make a difference." That Riley had taken a position favored by Abramoff, whether coincidentally or not, wasn't known at the time. While Abramoff's aide, Michael Scanlon (a former aide to Riley), gave $100,000 to Riley's campaign, Riley had previously opposed gambling in the state. In the late 1990s, he signed a fundraising letter lobbying against the building of a casino within Alabama. "We need your help today," the letter, which reflected another Abramoff objective, read, "to prevent the Poarch Creek Indians from building casinos in Alabama." Siegelman soldiered on after the 2002 loss, running again for governor against Riley in 2006. By then, the extent of Riley's connection to Abramoff was still unknown. Moreover, Siegelman was still under investigation for allegations of bribery. The inquiry, detailed in an extensive 60 Minutes report last night, raised many ethical red flags, mainly over political interference from the Bush administration, specifically Karl Rove. On June 22, McCain issued his Senate report without mentioning Riley's name. And one week later, Siegelman was convicted without the Abramoff email ever being made public. "If you had a document that showed something that had not been reported about the financial reports and the direct expectations for that money," said a source familiar with the case, "that certainly would have called into attention the government's case against Siegelman."